#UKAFNConf18 | ACEs, a lifelong influence? Professionals working in these settings will encounter children who have been or still are being exposed to Adverse Childhood Experiences as well as meeting adults who are suffering the effects of their Adverse Childhood Experiences. 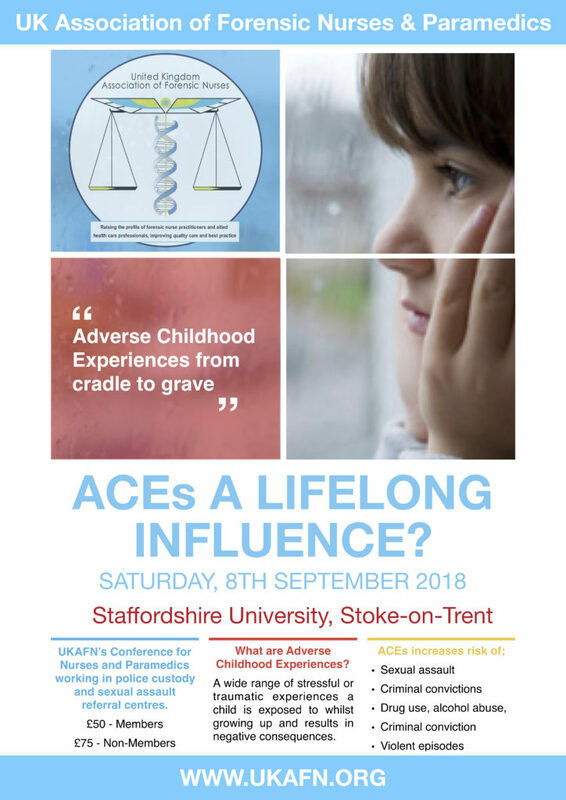 This conference will highlight the impact of Adverse Childhood Experiences and the negative effect these have across the individual’s lifespan and focus on how those of us working in police custody of Sexual Assault Referral Centres may be able to help. Rt Hon Lord Bradley PC was first elected as Member of Parliament (MP) for the constituency at the 1987 general election, having served as a councillor in Old Moat Ward (Manchester) since 1983. After the 1997 general election he became a junior minister at the Department of Social Security, and then became Deputy Chief Whip and Treasurer of the Queen’s Household in 1998. He was a junior minister in the Home Office for Criminal Justice, Sentencing, and Law Reform from 2001-2, and then a backbench MP and member of the Health Select Committee. He is a member of the Privy Council. In 2009, Lord Bradley authored a review of people with mental health problems or learning disabilities in the criminal justice system (the Bradley Report) to examine the extent to which offenders could, in appropriate cases, be diverted from prison to other services and the barriers to such diversion. Zoe will utilise neurobiology to highlight the human response to threat and its purpose in survival. She will then postulate that ‘immediate survival reaction’ (as seen in so many who experience ACEs), has a cost in terms of post-trauma symptomatology. Particularly, as is often the case, the symptomatology is not understood within the context of the traumas experienced and are instead perceived as ‘bad’ behaviour. This presentation looks at male victims/survivors of sexual abuse and asks why are we still so silent about male sexual violence. The presentation by REIGN will cover what Child Sexual Exploitation/Abuse (CSE/A) is from a survivors perspective, calling the statutory definition into question; the challenges faced by victims of CSE/A and engagement with services, and the effects of CSE/A as an adverse childhood experience on a young person into adulthood. The term Adverse Childhood Experiences (ACEs) is used to describe a wide range of stressful or traumatic experiences that children can be exposed to whilst growing up. ACEs range from experiences that directly harm a child (such as suffering physical, verbal or sexual abuse, and physical or emotional neglect) to those that affect the environment in which a child grows up (including parental separation, domestic violence, mental illness, alcohol abuse, drug use or incarceration). Studies have shown that the more ACEs individuals experience in childhood, the greater their risk of a wide range of health-harming behaviours and diseases as an adult. When exposed to stressful situations, the “fight, flight or freeze” response floods our brain with Corticotrophin-Releasing Hormones (CRH), which usually forms part of a normal and protective response that subsides once the stressful situation passes. However, when repeatedly exposed to ACEs, CRH is continually produced by the brain, which results in the child remaining permanently in this heightened state of alert and unable to return to their natural relaxed and recovered state. Children and young people who are exposed to ACEs, therefore, have increased – and sustained – levels of stress. In this heightened neurological state a young person is unable to think rationally and it is physiologically impossible for them to learn. ACEs can, therefore, have a negative impact on development in childhood and this can, in turn, give rise to harmful behaviours, social issues and health problems in adulthood. There is now a great deal of research demonstrating that ACEs can negatively affect lifelong mental and physical health by disrupting brain and organ development and by damaging the body’s system for defending against diseases. The more ACEs a child experiences, the greater the chance of health and/or social problems in later life. By Train: Stoke-On-Trent train station is ideally located for those travelling from afar. It is situated 0.2 miles, which is only a 5-minute walk from the station to the conference. Stok-On-Trent is serviced by trains from across England, Wales and Scotland. By Car: From the A500, follow the signs for ‘Staffs University. Pass under the railway bridge. At the roundabout take the first exit. Pass through the first set of lights and at the junction (with the City of Stoke-On-Trent Sixth Form College on the right) stay to the right side of the left-hand lane (marked ‘A52 Leeek’). Continue straight on through the traffic lights along Leek Road. After two pedestrian crossings, continue on a short distance until you reach the next set of traffic lights. You will notice the Staffordshire University main entrance on the right. Turn right onto the campus. See map for printable instructions and map. Parking: There are five car parks on the Leek Road site at the Stoke-On-Trent campus. Car park 1 is immediately on your left at the mini roundabout. All other car parks can be found by turning right. Please refer to the detailed campus map for the exact locations. POSTCODE FOR CAR PARK: ST4 2DF.